American Philatelist The scholarly monthly journal of the American Philatelic Society. Australasian Stamps Glossy monthly magazine for the Australasian and Asia-Pacific regions. Canadian Stamp News 26 issues per year of stamp stories, news and collecting tips. Compulatelist The quarterly newsletter of the Philatelic Computing Study Group contains reviews and descriptions of computer-based resources for the stamp collector. Gibbons Stamp Monthly By Stanley Gibbons, the British publisher of albums and catalogs, it includes a monthly catalog supplement. Global Stamp News Tabloid-sized monthly philatelic news magazine. The GB Journal Journal of the Great Britain Philatelic Society. International Stamp News A Stanley Gibbons trade journal, available free upon request. 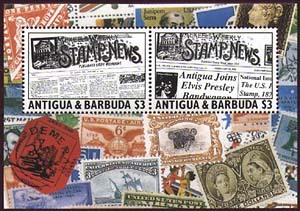 Linn's Stamp News Weekly stamp newspaper backed up by an informative web site. Mekeel's and Stamps Magazine In publication since 1891, Mekeel's is the world's oldest continuing stamp weekly. It is also the subject of the first postal issue to honor a stamp magazine. Contact Mekeel's, Box 5050, White Plains, NY 10602. The Philatelic FKR Magazine Quarterly from Poland devoted to worldwide stamp exchange. Scott Stamp Monthly Monthly survey of the stamp world put out by the creators of the Scott catalogs, albums and the widely used stamp numbering system. Stamp Collector Newspaper issued twice a month by Krause Publications, publisher of the Krause-Minkus catalogs. Stamp Lover Official journal of Great Britain's National Philatelic Society. Stamp Magazine British magazine for worldwide collectors. Stamp News Philatelic monthly from Australia. The Stamp Wholesaler Krause monthly journal geared to professionals in the stamp trade. Subscription includes a biannual Buyer's Guide. U.S. Stamp News Bimonthly magazine for U.S. stamp and cover collectors. Catalogues, Magazines, Newsletters List of links from Francis Chan's Stamp Resources. Philatelic Publications of the World Comprehensive listing cataloged by American Philatelic Research Library. Principal Stamp Publications World directory arranged by country, from AskPhil. Stamp Magazines (Not in English) Listopedia list of foreign language periodicals. Stamp Publications (Printed) Compiled by Stamp Yellow Pages Directory.